If you have a cable modem or DSL connection, or if you have already viewed the small movie, you are already watching the home movie shot in the 1950s that was the inspiration for this website. You'll notice at the beginning of the sequence that Bobo is holding my right hand with his left, while swinging an umbrella in his right hand. Then, suddenly, the video picks up a few moments later, after the worm has popped out. The video has not been edited for content, but part of the action is missing. The original 8mm silent film was shot on a 1950s Kodak Brownie wind-up movie camera, and it was time to wind the camera. So let's try to reconstruct the gap. At some point, Bobo must stop and turn to his left to face me, hang the umbrella on his left forearm (you can see it swinging on his left forearm in the second part of the sequence), produce an apple, and then make the worm pop out. I am startled (I react with my left hand), but I can't get away, because Bobo is still holding me tightly by my right hand! I can still remember the strong moth ball-like smell of his oversized yellow and black checkered jacket. Now playing: The home movie that everyone is talking about! See Bobo in action as he makes the worm pop out right before your startled eyes! Alright, you've seen the video (hopefully). Now I want your opinion. 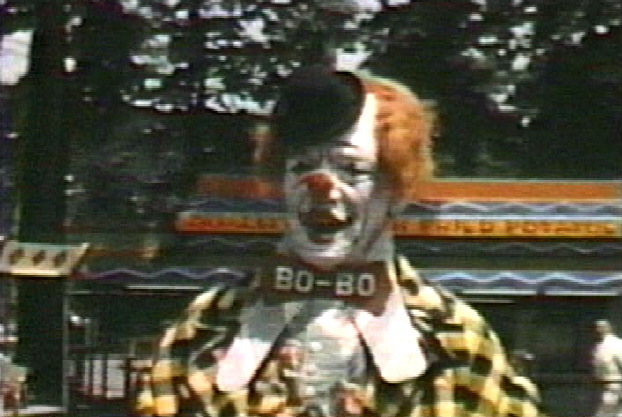 Was Bobo a bad clown? Or was he just misunderstood -- a sad, little man who put on clown makeup to hide his tears? We here at Bobo World International Headquarters would like to state emphatically for the record that the movie clip you are watching is 100% authentic. The original 8mm film, shot on a Kodak Brownie movie camera, was transferred to a high-grade VHS tape at a professional photo shop. It was then recorded onto an Apple Power Mac 7500 computer via its built-in video digitizing circuitry and the recording feature of the Apple Video Player. It was then edited in QuickTime® 4 as follows: 1) The QuickTime® file was slightly edited for time (about 15 frames were removed from the top of the walk, when Bobo and I were farther away, avoiding an ugly jump cut); 2) certain frames were removed: a) the bad frames were removed (in old 8mm cameras, if the film was loaded improperly, it would cause the gate to "chatter", and would periodically produce a blurred frame of film, or a frame with one prominent image and one ghosted one. These ugly, unnecessary frames have been removed). b) Also, repeated frames were removed (video runs @30 frames per second, and 8mm film ran @18 frames per second. Every few frames of the film are repeated during the transfer process to make up for this difference. Those frames were removed as well, since the frame rate of an animated GIF sequence (our final product here, achieved by importing the QuickTime® movie into GifBuilder) is relative on the internet, depending on many factors such as your connection speed, the speed of your processor, and your video card's speed). 3) The video was not edited for content, nor enhanced in any way with filters or other methods. 4) The worm is a real clown prop and is not a special effect. As for how Bobo affected me, well, I am completely healed of his trickery, except for the recurring nightmare I keep having..... I find myself as a young boy again, standing in the middle of an empty street partially hidden in darkness and fog... I see Bobo standing under a lone streetlight in the misty distance... He's dressed in a trenchcoat and curled-down fedora, with a hand-rolled cigarette hanging out of the corner of his mouth... As he lights it up, I can see that he still has his clown makeup and costume on under the trenchcoat... He puts out the match and looks up at me... His sparkling, ebony eyes pierce my soul as he beckons to me repeatedly with a curled-up finger and sinister smile... I am irresistibly drawn to him... He takes my hand. Suddenly, we are back at the amusement park! The lights confuse me in a dazzling spectacle of blurred images... Bobo lures me to his trailer with promises of sweet, glistening cotton candy and ice cold soda pop... I follow him slowly up the creaky stairs, pausing at each step to look up... I look back over my shoulder once, bite my lip, and cautiously follow him inside. The door to the trailer mysteriously closes and locks behind me! A damp, fetid, moldy smell fills my nostrils as the lights dim to the sound of creepy, shadowy figures rustling in the background... Bobo comes slowly out of the shadows and turns to me, holding a huge, shiny, red apple, and laughs insanely... his face lights up brightly... a worm pops out the size of a bratwurst..... and then I wake up screaming! Protect your children from Bobo!